Let’s go out and have a grand celebration on the most amazing occasion of the year… Your birthday!!! Happy birthday!! The stage has been set and we are all waiting for the party to roll!! So, let’s go out there and celebrate your birthday!! Happy birthday!! The time has come again to party hard and have a great time!!! Let’s celebrate your birthday in an even crazier way as we did last year!! Happy birthday!! Today, I wish to let you know, that your presence in my life has moved and influenced me more than you can ever imagine and all I want to say is, Thank You!! Have a great birthday today!! I would like to extend my heartiest birthday greetings to you on your big day!! Have a happy birthday and God bless you!! A birthday is the day when you get the opportunity to thank god for giving you the most beautiful gift i.e. your life!! Happy birthday and may God keep blessing you!! Wishing you a very happy and cheerful birthday, my dear!! May god bless you and give you all the success in life!! May the almighty guide your life and take you to heights that you never even imagined!! Have a great birthday!! Hey there!! Wishing you a very happy and joyous birthday my dear friend!! God bless you and have lots of fun today!! Happy birthday to the most amazing, caring and heart warming person I have ever known. May all your dreams see the light of the day and you keep smiling always. I love the amazing parties you throw on your big day. So I am really happy on witnessing another passing year of your life and stealing the cakes away. Happy birthday!! It is really sad that birthdays come only once in a year. For it’s hard to wait for free champagne and good food for so long. Happy birthday!! Happy birthday my dear buddy. Though age is catching up with you really fast, we won’t spare you from the dance floor, over dose of food and crazy parties today. Have a great and happy birthday. May it rain happiness in your life and your problems hit a dry patch. May you always keep brightening the world with your smile! Hurry up buddy and put on your dancing shoes for we are going out tonight to party and welcome your birthday in style. And yes happy birthday. Happy birthday dear. You are an amazing and beautiful person. I wish you never change and always stay the same and happy birthday. Happy birthday my crazy, stupid friend. You are always close to my heart and even though we are miles apart you never are far from my thoughts. Lets shout out loud and sing the birthday song. 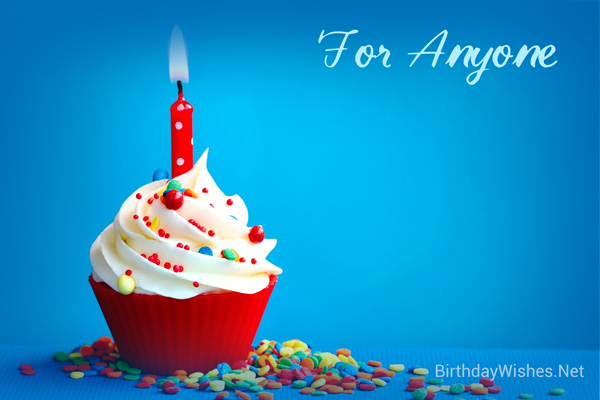 It is your birthday; let’s celebrate it in a special, crazy, fun filled way. Happy birthday!! Hope your birthday is full of endless blessings, laughter and music. And I sincerely hope that your year ahead reflects the celebration of your birthday. Happy birthday! !